This large studio apartment is located in a peaceful garden square yet close to all the facilities and attractions of Camden. The apartment is located on the lower ground floor of a grand white stucco house and provides direct access via its own front door a few steps down at the side of the main house. The apartment has been recently refurbished and includes everything you will need for a very comfortable stay in London. It contains a five ft king size pocket sprung bed with top quality bed linen and pillows, a comfortable sofa, table and chairs, desk, fully fitted kitchen and brand new shower room with constant hot water. For your entertainment there is a television with multiple satellite channels, as well as free wifi. All towels, bed linen and cleaning included in the rates – no hidden extras! Nearby buses and tubes take you directly to all London locations. Great bars, restaurants, shops and the famous Camden market are all nearby. This large studio is in a perfect location . Easy access to the trains and close to a lot of attractions. Mary is an AWESOME host and her place is fully stocked. Would highly recommend this place!! Beautifully appointed, lovely setting, gracious hosts. We rented Mary’s flat for a week in March and we thoroughly enjoyed every aspect of our stay. Perfectly appointed for a couple, the queen bed has lovely sheeting, the kitchen is a marvel of efficiency and has things like salt and pepper and olive oil, the bathroom was sparkling clean and the space is quiet and very comfortable. The location is excellent; transit almost at the door step and a short distance to just about everywhere. We spoke briefly with Mary and her husband and they are both very helpful and gracious. We would stay here again in a heartbeat. Everything was as nice as advertised. Mary was very friendly and accommodating. I highly recommend! The best in ten years of staying in aptms. Wonderful cozy space. Quiet street and cool area. I would recommend mary’s Place for sure. Everything you need is in the place. Nice sheets, towels, easy kitchen and comfy bed. The area is fun to walk around and shop at Camden market for sure. Tube is close and lots of good places to eat around there. This flat is a real gem, perfect for a couple. The thoughtful details make the compact space seem generous and very appealing. Perfectly located in a quiet, clean street, the flat is handy to ammenities, underground and overground trains and a short walk to all the new developments around Kings Cross & St Pancras. We spent a comfortable few weeks in this beautifully presented and very clean flat. Thank you Mary! 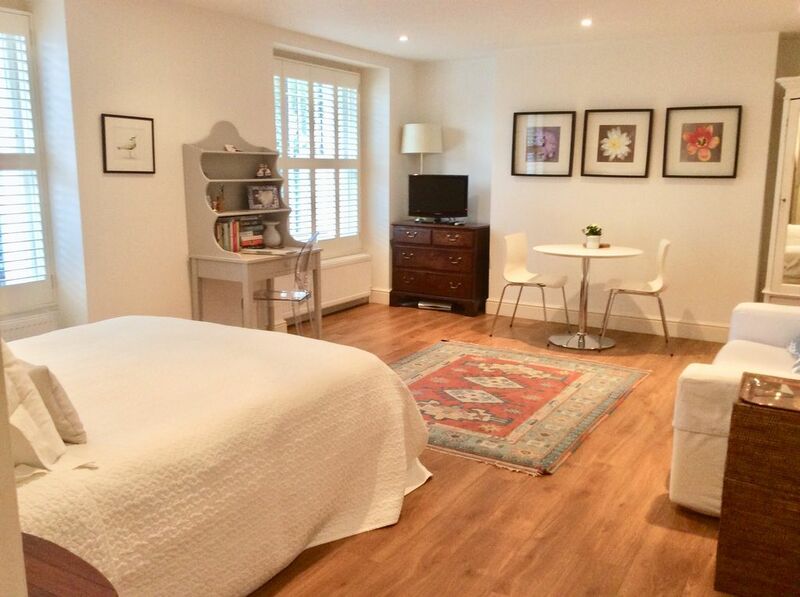 The apartment is located in a peaceful leafy square yet only a few minutes away from the hustle and bustle of Camden Town with its world famous market, shops, restaurants and bars. Buses run very close to the house and will take you directly to most central London locations – Regents Park, London Zoo, Madame Tussauds, Oxford Street, the British Museum are all only a short bus ride away. The overground train station is five minutes away and the tube station a 10 minute walk. Euston is only one stop on the tube, Kings Cross two stops and Oxford Street shopping merely three stops (10 minutes by tube) away. A 24 hour convenience store is very close to the apartment and a large supermarket is only a 5 minute walk. Bars and restaurants to suit every taste can be found in Camden Town. - Rates include bed linen, towels and check out cleaning. No hidden extras.